Sen. Clinton appeared on The Daily Show late Monday night. (CNN) - Two nights after poking fun at herself on Saturday Night Live – and hours before voting began in the critical March 4 primaries - Sen. Hillary Clinton took another late night comedy turn. The Daily Show’s Jon Stewart teased the Democratic presidential candidate for speaking with him on the eve of Tuesday's crucial primaries in Ohio, Rhode Island, Texas, and Vermont. "As a host, I'm delighted. As a citizen, I'm frightened," Stewart quipped. "It is pretty pathetic," she said, as he burst out in laughter. 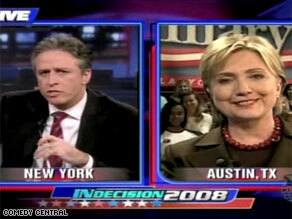 Clinton spoke to Stewart from Austin, Texas via satellite. The long satellite delay caused a few awkward exchanges, with both joking that the connection was coming from Mars. Clinton last appeared on The Daily Show in 2003, but the two chummed around like old friends. Clinton even kidded that she wished Stewart were down in Texas with her. "You could make fun of us in person, instead of by remote," said Clinton. Stewart responded: "To know you're people with feelings, it would just be too much." Between light-hearted moments, Clinton praised the two largest states voting on Tuesday and reiterated that the race is far from over. "I love both Texas and Ohio because they're states that are complex and there are a lot of variety in each of them," she remarked. "I think what we're going to find out tomorrow is we're still in a very close contest in terms of the popular vote and the number of delegates. …My husband (former President Bill Clinton) didn't wrap up the nomination until June." Why would the republicans be afraid to run against Obama? You need to think logically. They are afraid to run againt Clinton, after all when was the last time a Republican beat a Clinton to take the White House? Before any of you go to the polls today, I URGE you to read the Issues section on this website. It gives a clear stance from each of the candidates on a variety of issues. I lived through the idea of "trickle down" economics once. It didn't work then, and it won't work now. Yet candidate Obama's plan for taxes is exactly that. For my income level, I would definately be a recipient of his rebates. But they are extremely irresponsible and I don't support them. The poll by CNN shows that a full third of Americans would put that money into savings. Another third would pay off credit debt. Neither of those options puts the money back into the economic sector. In other words, with Obama the only economic change will be for the worsening of our already failing economy. Fellow Americans, please think not about who is "cool" but who will in the long run actually elicit a change that is good for all Americans. We can no longer afford to be wrong. Thanks from a concerned mother. 2009 is a new year when we throw out the old and bring in a New Year. Some people seem to want to carry over the old into the New Year, and Hillary is not part of the New Year, she's a leftover from the old year. When we say celebrate a New Year and throw out the old and bring in the new, Barack Obama is the beginning of a New Year. Vote Barack Obama to celebrate your New Year. I don't understand the comments criticizing Clinton for appearing on The Daily Show and Saturday Night Live. Obama has appeard on both programs as have many other notable politicians and world leaders. People are not considered "frivilous" or "a joke" for appearing on these shows. In fact, the opposite is quite true. It shows they are well-rounded and willing to speak to various audiences. In general, it is only the far right and the Christian conservatives that eschew these outlets. But she MISSED the Colbert bump!! Hmmm...wonder why John Stewart didn't ask her what she meant when she implied in a speech yesterday that McCain would make a better president than Obama. Could it be that she would rather see her own party lose in November if she can't be the nominee? Well, that would give her a chance to try again in 4 years. It was a real low blow, not to Barack, but to her entire party. I was on the fence, but that comment did it for me. Go Obama. At least he puts principles above his personal ambitions. There have been several superdelegate endorsements for Senator Obama today. Please report on them. Thank you. WT* is wrong with you people? Have you forgotten the Clinton conspiracies? The scandals. The finger wagging. The lies. She can't win in Nov. Half her party doesn't like her. She's a political robot. How can you seriously believe she is against NAFTA when her husbands administration implemented it? Are you blind? Some of the greatest commander and chief's have been new guys. Lincoln and JFK. As Obama says "if Universal Healthcare was easy, it would've been done already". Thanks to robot Clinton that didn't work in 1992 and it won't work in 2009, if she's the President. McCain is too old and a Bush yes men, while Hilary is a lying robot with a history of lying. Trying to compare Obama's Canandian misunderstanding with the Clinton's scores of scandals is laughable. Myself and most democrats will be totally disillusioned with Politics if Obama doesn't win. Thus paving the way for 4 more years of Republican policies and US looking like fools to the rest of the world. Where is Barack Obama hot topic link? I see Hillary C and John M, whats wrong CNN? Everything Hillary does and says is PLANTED. Like the planted questions in Iowa and Wisconsin. If it wasn't for a man, Bill Clinton, she would be nowhere. Bill has a lot *friends* including lots in the Canadian conservative government and the communism Chinese government. Since Clinton whined, the media has enabled every ploy she has unfurled. It's very sad. It just shows the media is what's holding this country back. A candidate who is positive CANNOT win. Come on. You've got to admit "Pant Suit On Fire" is a pretty funny description for Hillary. I mean, come on, where have YOU been for the last 18 years? I am changing to Hillary. Obama is looking more and more phony and like same old. Media played him up and boosted his votes. Media bashed Clinton and ruined things for her. Besides, as a registered democrat, I want the say of who is my nominee, the independents and republicans should not be able to decide for me. This is 3rd world politics and the DNC needs to know: registered democrats are NOT okay with independents and republicans choosing our nominee for us. i am not surprised that most young people are for obama. they clearly need to grow up! Just voted in Ohio for OBAMA! why is limbaughs opinion so great to the Amer. public. i guess we forget about what he did.